The hosts bow out of the tournament unbeaten with three draws to their name, and that perfectly sums up a side that was respectable defensively but had a midfield and an attack that failed to flourish. The attacking thrust, apart from the sporadic runs of the livewire Denis Bouanga, by far their best attacker in the tournament, was nowhere to be seen in their games, certainly not for prolonged periods. Pierre-Emerick Aubameyang may have notched two goals but his non-goalscoring activities exuded disinterest and indifference. Malick Evouna, once one of Africa’s most feared continent-based attackers, wasn’t at the races; his touch too heavy and his lethality deserting him. Just like two years ago, a key link between midfield and attack was missing. Play-making is not Didier N’Dong’s forte and he and his fellow midfielders huffed and puffed but lacked the guile and craft to dominate midfield battles and connect with the attackers. All in all, Camacho’s game plan was never clear. He didn’t know his system, he didn’t know seem to know his personnel, and he never looked close to solving any of the issues. It is hard to foresee how they would have gone all the way even had they made it to the quarter-finals. You could argue the margins are fine and they needed a dose of luck – they could have won the game tonight and should have won their opener versus Guinea-Bissau – but they didn’t activate their home advantage to qualify from what was, in pre-tournament, the kindest draw they could have hoped for. The underperformance of Gabon in the final third was mirrored in the performances of Pierre-Emerick Aubameyang throughout this tournament. You would hope that any player representing his country at a major tournament, at the very least, tries his hardest. That is an unspoken expectation. If you don’t want to accuse Aubameyang of being lazy, which I don’t, the most diplomatic thing to say is that his performances in this tournament have been uncharacteristic. Five years ago he came into the tournament as a relative unknown and had a breakout campaign in a Gabon team that was, man-for-man, worse than this one. Now, with the strong core still in place and more mature, plus Aubameyang’s development into a world class striker, far more was expected. The differences couldn’t have been more stark. In 2012 he almost single-handedly pulled Gabon through to the knockout stages, tearing the opposition to pieces with his pace whether deployed centrally or, when that didn’t work, on the right wing. That intensity, whether it’s his fault or the coach’s fault, and hunger for glory was missing this time around, particularly tonight in what was a must-win game. In the end, the margins between the middleweight teams in these tournaments are fine. Had Denis Bouanga’s injury-time shot, or Didier N’Dong’s follow-up, gone past Fabrice Ondoa you could say I wouldn’t have written these words in praise of Cameroon. The likelihood is that I still would have. The last-minute pull-outs saw Hugo Broos given a terrible hand for this tournament and he has made the most of what is an unideal situation. This Cameroon side are not a remarkable team by any stretch but the sign that a coach is doing a good job is that he’s getting the most out of what he has, and Hugo Broos certainly has done that, with the likes of Christian Bassogog and Sebastien Siani coming to life, even had they failed to make it out of the group. For that he deserves some credit. When Burkina Faso made the final in 2013, they made it out of their group with 5 points – two draws and a comfortable win over group minnows Ethiopia. This was despite a tournament-ending injury to key player Alain Traore. Four years later, it’s happened again – well-earned draws with Cameroon and Gabon, and a comfortable win over group minnows Guinea-Bissau. This was despite a tournament-ending injury to key player Jonathan Pitroipa. The truth is, Burkina Faso may not look like the most fluid or exciting team but they are once again proving tough to beat- their defence looks well-organised and they seem to be producing enough goal-scoring chances, even if they aren’t always taking them. And now they are heading into knockout football, where that speciality really begins to mean something. Credit must go to Paulo Duarte. After the last AFCON two years ago, Paul Put was dismissed and it was looking like the team was going to need to be rebuilt, not just in terms of personnel, but also confidence and aura. He seems to have done this – while they don’t have the swagger of Senegal, they know how to play knockout football, because they mastered it in the 2013 campaign. As Salim said in the video chat last night, the best teams in AFCON self-manage, but Duarte is guiding them well. I don’t think there’s a team in the competition who will want to play Burkina Faso right now. While Burkina Faso definitely took their foot off the gas after the comical own goal which gave them the lead, Guinea-Bissau deserve credit for the way they battled back, taking control of the game in the first half. An equaliser looked on the cards, only for their momentum to be interrupted by the interval. In the second half, they didn’t quite grasp the initiative in the way they needed to, which let Burkina Faso back into the game. But ultimately what let them down is a total lack of finishing ability. Granted, Herve Koffi was again excellent in the Burkinabe goal, commanding his area in set pieces, but a lot of the saves he made were from shots that were just straight at him – and even more often he was left staring at attempts that were nowhere near the goal. The brunt of the criticism must surely fall on Frederic Mendy, who was pants. Guinea-Bissau really missed Cicero, their long-time striker who played in qualifying but missed the tournament through injury. There were others absent too who might have made the difference. You can tell it was just a little too disjointed – their two goals in the tournament came from a set piece and a counter-attack. When they had the ball in the opposition half, too often they didn’t quite know how to use it effectively, and that’s why they’re heading home. 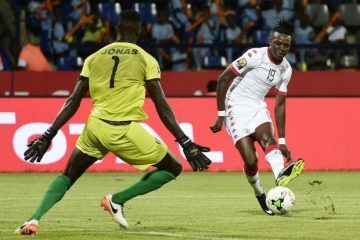 So often the focus in this Burkina Faso team has been on Alain Traore and Jonathan Pitroipa, but the one-time teenage prodigy Bertrand Traore now seems to be blossoming on the international stage at the age of 21. Still officially a Chelsea player, the Ajax man missed a great early one-on-one chance to put the Stallions in front, but made up for it in the second half by converting from the same position to put the game out of Guinea-Bissau’s reach. With Pitroipa out for the rest of this tournament due to injury, brother Alain not as influential as he was in the 2013 team and Aristide Bance being his usual erratic self, Bertrand and Prejuce Nakoulma are stepping up in Gabon to be the most influential players in this Burkina Faso attack. The question is, while they have shown they can raise their game intermittently in the group stage, can they do it when it counts in the knockout stage, where there are no second chances? They have avoided Senegal by winning the group, which could be crucial – they will likely play Tunisia, who have struggled for goals at times and may find it tough to break down this defensive unit. Perhaps this is the start of another big Burkinabe run in this competition. They are at least giving themselves a fighting chance of it, by doing everything they need to do in every match they have played.